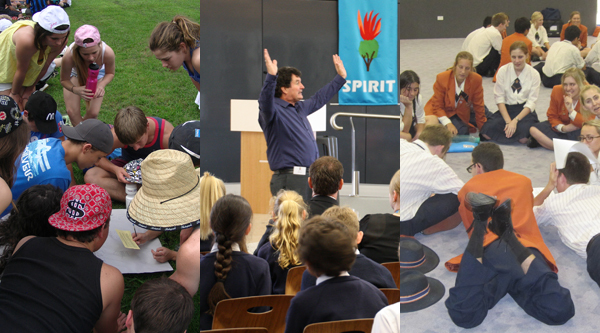 A full day event provides the maximum opportunity to gain the most from Graham with your students. The extended time allows a more thorough treatment of the topics as well as creating a greater integration of Graham’s presentation and student thinking. As well as enjoying the group experience of hearing the talks, reflecting privately and group discussions students often take the opportunity to talk their issues through with Graham during the recess and lunch breaks. A feature of the full day event is always the afternoon session that consists of feedback by students of the results of their group work and the concluding game ‘Together We Can’ which creates a lot of fun while it bonds students. There are 3 single purpose full day events Graham runs More than a Badge (Leadership, years 11 & 12), Survive! (transition to senior school, year 10) and Life’s a Jungle (Transition to High School, years 7 & 8). Alternatively, schools frequently combine Graham’s single session topics to create a day that impacts students over a broader range of issues. Common pairings are Not Alone and Stand Tall, Not Alone and Take Charge, Stand Tall and Take Charge.